This ransomware, also known as R980 ransomware, resembles some aspects of RANSOM_MADLOCKER as it drops files other than ransom notes. It also avoids certain file paths. It asks its victims to pay .5 bitcoin as ransom. Scan your computer with your Trend Micro product to delete files detected as RANSOM_CRYPBEE.A. If the detected files have already been cleaned, deleted, or quarantined by your Trend Micro product, no further step is required. You may opt to simply delete the quarantined files. Please check this Knowledge Base page for more information. 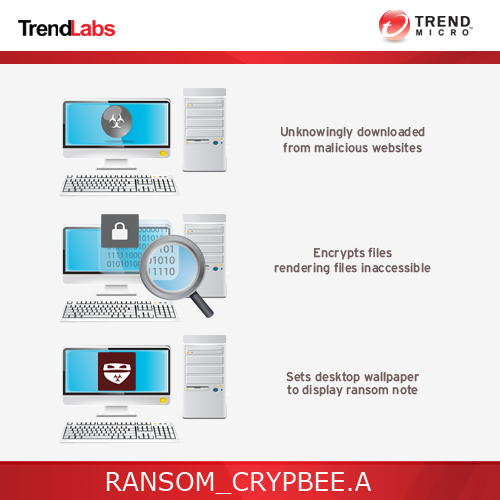 Restart in normal mode and scan your computer with your Trend Micro product for files detected as RANSOM_CRYPBEE.A. If the detected files have already been cleaned, deleted, or quarantined by your Trend Micro product, no further step is required. You may opt to simply delete the quarantined files. Please check this Knowledge Base page for more information.